The George Spencer, U.S. Registry 85849, was built in 1884 at Cleveland, Ohio by Thomas Quayle & Sons for Captain Thomas Wilson. The vessel was named for George Spencer, an intimate friend of Wilson’s. The George Spencer’s keel was laid on February 18, and its first frame on the February 25th. The Spencer had a length of 230.5 feet, a beam of 37.2 feet, and a depth of hold of 18.8 feet. First inspected in July, 1884, the vessel was listed as 1360 gross tons and 1082 net. Constructed of wood, the Spencer had steel arches on its ceiling and on the frames outside, bolted through and through. It carried three masts. The Spencer had a gross tonnage of 1412 and a net tonnage of 1134. It drew 4.5 feet forward and 9 feet aft. Period photographs show it had a bluff bow with a full entrance and a folding stock anchor on its bow with the anchor chain emanating from one of the vessel’s four bow hawse holes. The Spencer’s raised forecastle deck supported the pilot house. 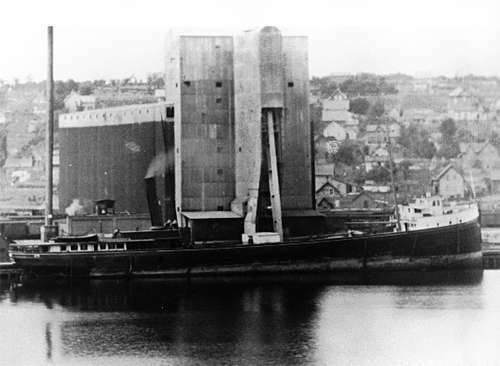 The vessel had a raised after deckcabin with at least six side windows on each side. Atop the deckcabin sat a lifeboat. 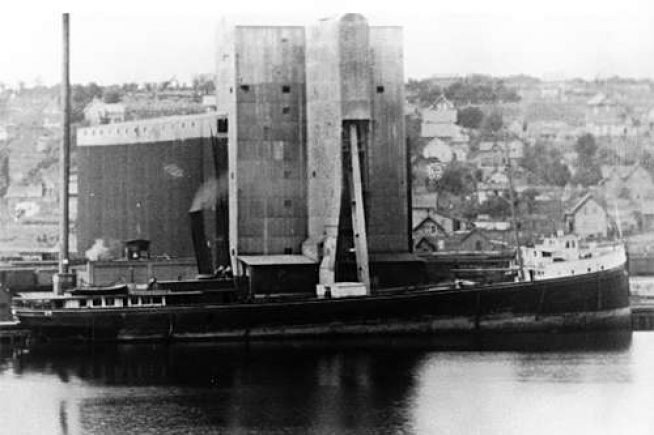 The vessel’s large black single smoke stack stood just forward of the cabin and immediately aft of the aft mast. Located just aft of the central mainmast was a small cabin. All the cabins on the vessel were painted white. All three of its masts were gaff rigged and each had a topmast. The Spencer was equipped with a fore and aft compound engine, 27 inches and 50 inches diameter by 36 inch stroke, built by Globe Iron Works of Cleveland, Ohio. The 625 horse power engine had cranks opposite and steam reversing gear, making it a duplicate of the engine built for the Robert Wallace and similar to the machinery in Captain Wilson’s other new steamer theKasota. The Spencer had a hoisting engine on the spar deck, with a pony boiler sufficient to run the engine. Both the bilge and fire pump were operated by the hoisting engine. The Spencerhad one return flue boiler, Otis Steel, 10.5 feet in diameter by 17 feet long, with double furnaces and which could carry 100 pounds of steam. The boiler was also constructed by the Globe Iron Works of Cleveland. There was a wrought iron pan and iron deck beams under the boiler and Beache’s hot air casing over the boiler. The Spencer was equipped with a Providence ship windlass, from the American Ship Windlass Company, of Providence. The Spencer and Amboy were bound for Duluth with coal when they were overpowered by the famous “Mataafa Storm.” A complete description of the loss is given below. When the storm was over and the toll tallied, 18 ships were discovered to be disabled or destroyed by stranding, one had foundered with all hands, and nearly a dozen others suffered various degrees of injuries to hulls or superstructures. Five of the mishaps had fatalities. In lakes history, this is called the “Mataafa Blow,” in memory of a major steel carrier wrecked at the Duluth entrance jetties. A total of 36 lives were lost in the storm on Lake Superior alone. The wreckage of the George Spencer lies just off the beach approximately 1 mile south of Sugar Loaf Cove. The quarter mile long stretch of beach is crescent shaped and blends from sand on the south to large beach cobbles on the north. The remains of the Spencer include a 141-foot section of the base of its hull from the turn of the bilge down. The longitudinal axis of the hull lies perpendicular to the beach. What is believed to be the bow end of the wreckage lies 40 feet from shore in 3 feet of water, the opposite end lying in 20 feet. Both boats lost their bearings in the snowstorm and landed on a sandy beach. As soon as they struck, buoys with lines were thrown over the side. When they floated ashore they were caught by fishermen and made fast. With an improvised life buoy rigged in the hawsers the entire crew were taken safely to shore preceded by Mrs. Harry Lawe, wife of the mate, who was acting as steward. The vessels ran on the rocks Tuesday morning, and for thirteen hours the situation of the crew on the battered hulks was desperate. Fishermen rushed into the surf almost to their necks and aided the sailors to escape. The Spencer’s cargo can be lightered but there is little hope for saving the boat. The vessels were coming up without cargo to load ore. Capt. Frank Conland sailed the Spencer and Fred Watson was master of the Amboy. The Spencer was valued at $35,000 and the Amboy at $10,000. 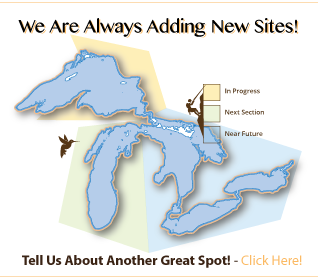 IMPORTANT NOTE: Great Lakes Drive, affiliates, and site resources are not responsible for any incidents attributed to the use of this information. All information provided on this site should be considered a simple bit of information that informs the average individual on activities or available lodging that others have participated in, and in many cases warns them of dangerous aspects of a location, and should not be considered a promotion for taking part in the activity or a recommendation to use, stay, or support. Some of these pages represent extremely dangerous activities and should not be considered by individuals and families as normal activities. Many of the links provide information contributed by professionals or adrenaline junkies and are meant only as interesting points. Other information would probably never be heard about and represents wonderful historic facts and fiction about places that have disappeared. All activities from driving a car to entering the water can be hazardous and should be taken on at your own risk. Take responsibility for your actions and be very careful when exploring this wonderful fast land that is available to us all. 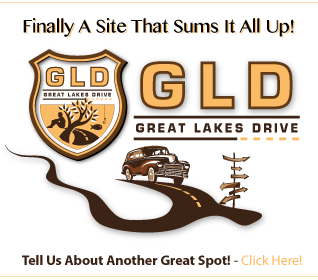 Ads on the site may be from awesome companies but for legal reasons they do not necessarily represent the beliefs or receive the support of GreatLakesDrive.com. By reading the information on a page, and/or clicking on any of the links, you agree to take full responsibility in the result. Drive Safely! Stay on the path if you are concerned about the results of stepping off the edge. Discover a wonderful place right in your own backyard! You will never forget it.